for my dad on Father's day. The International Club at Marquette University asked my mom to organize its first Filipino Culture night with the only six Filipino graduate students registered at the university—hardly enough for a true extravaganza. So someone suggested she invite the Filipino doctors at Deaconess to participate. "Maybe you can get Mike Galang to help you," they told her. "He comes to all the meetings." So in October in 1958, my mother attended the International Institute of Milwaukee's welcome reception for all newcomers. The auditorium was hot, muggy, and full of internationals from all over the city. Someone had placed a long piece of wood at the door to prop it open. The mayor was giving his opening remarks. Then a loud bang. She looked up and saw my father falling into the room with his long legs kicking up into the air. He had tripped over the piece of wood. 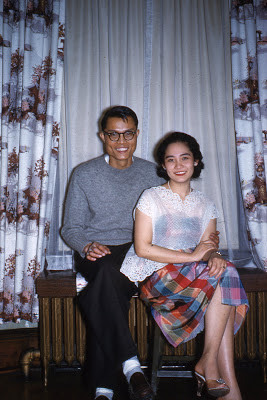 Wouldn’t you know it: my parents took the lead, rehearsing every night, coordinating the music (piano playing he did by ear), creating colorful backdrops, practicing Philippine folk dances and working late and long to make a great culture night (FASA's and FSA's you know what I mean here). “I didn’t know,” my mother will say. “We were just working together, always together.” She’d write her mother long letters about her life in the U.S.
“Who is this Mike she keeps writing about?” my lola wanted to know. She knew something was up. Forty years after their first culture night, I was asked to read at Marquette’s Filipino Culture Night. My parents sat in the auditorium. What a lovely story ... and that image of your parents is beautiful.